"If you know the music, you’ll recognise some old tunes," says Pat Metheny, mid-way through his mammoth set. That, and a quick name—check for the band (Antonio Sanchez on drums, Linda May Han Oh on bass, Gwilym Simcock on piano) was it for the announcements. Then: “we’re going to keep on playing for you”. And keep on playing they did, no-one more than the leader. The band get small breaks, as various trios and duos configure. But aside from a brief solo piano segment, Metheny is active throughout. Now in his 60s, after 40-plus years on the road, it’s hard to think of anyone who projects more pure joy in music-making. And the music is all his own. The current show reaches back to Bright Size Life, his first trio release for ECM back in 1976, with three or four of those most hummable tunes appearing early in the set. 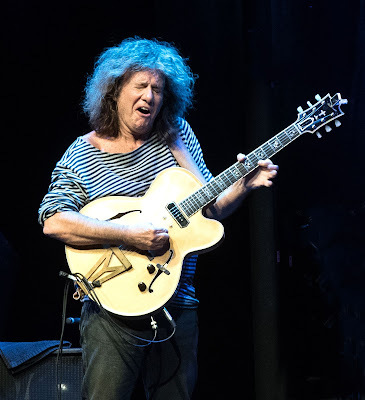 Then it ranges over the guitarist’s large output, with pieces from the various Pat Metheny groups and recordings with Holland and Haynes, and with John Scofield. It is generally the jazzier side of his career, and that suits the current group - young hot-shots who grew up on his music - perfectly. The piano comping on the first few tunes is inaudible but as more space opens up the balance comes to Simcock and our own young piano star proves fully as resourceful as Metheny. Linda Oh is hyper-responsive on bass and Sanchez, though his busyness can be relentless, is technically immaculate and reduces the energy levels when he needs to. They complement the many shades of guitar wizardry beautifully. 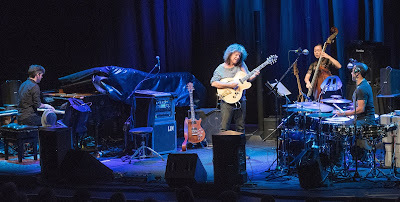 Metheny begins solo on his custom-built, many stringed Pikasso, which produces a sound I don’t care for but displays his orchestral instincts to good effect, then switches between solid-bodied and hollow electric instruments. Other guitars come and go, but Pat keeps on playing. There are long stretches of impassioned speed-jazz soloing, slow ballads, a fast electric blues that triggers old-school exchanges with drums and bass, a seriously fuzz-ed up free episode that leads to an exuberant collective improv, acoustic reflections and electric playing that sings, but also shrieks. The two-hour set finishes with richly realised duos with piano, bass and drums in turn. But we’re not done. Pat, perspiring but still full of beans, returns for an extended solo acoustic medley which delivers enough music for another mini-concert, and there’s a lengthy final flourish from the quartet all together. A man as restlessly creative as this will surely move on to more projects. But for now, this career-retrospective, with this band, developing on tour for the last couple of years, is a hell of a show. Gwilym clearly struggling with ?RSI, constant stretching, warming/cooling of wrists and hardly playing on some songs, but no mention anywhere. Hope he gets it fixed soon. This was a terrible gig. I thought the fantastic musicianship and obvious talent of all involved was completely eclipsed by atrocious sounds. wonderful sound from where I was sitting (circle; centre). 3 of us and all agreed it was among the best we'd been to. Gwilym was wearing some sort of wrist/lower arm support on his right arm at least and at times was wringing out his hand. Hope he's well soon. Metheny is on another planet and the set was long and varied. Outstanding. Great musician, probably too busy, but why the histrionics? Totally agree with sound quality - saw them at Warwick Arts Centre and the sound was appalling! Couldn't hear a lot of what Pat was playing and when I could hear it the tone on his guitar was just awful. Couldn't decide if it was his choice of amp coupled with very poor PA?